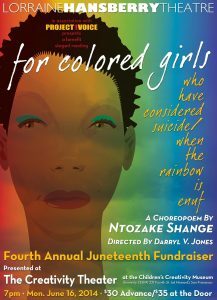 Chosen to celebrate what it means to be female, FOR COLORED GIRLS WHO… was presented in partnership with the National Black Leadership Commission on AIDS (NBLCA) in the extraordinary atrium of the Harlem Hospital Center. Directed by Seret Scott with the playwright in attendance, it featuring original Broadway cast members Trazana Beverly, Lori Carlos, Janet League-Katzin and Michele Shay alongside Adriane Lenox, Phyllis Yvonne Stickney, Lillias White and others. 32 theaters participated nationwide, in addition to Flytime Productions of Lagos, Nigeria.